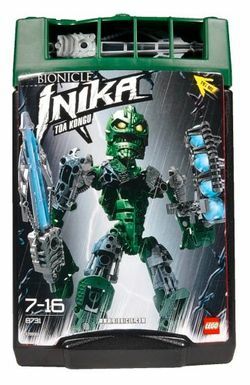 8731 Toa Kongu is a BIONICLE set released in 2006. He is one of the six Toa Inika. He is armed with a Zamor Sphere launcher and a Laser Crossbow, and wears the Suletu: the Great Mask of Telepathy. In the BIONICLE storyline he was a Toa of Air. This is Kongu's first appearance in a regular set (second including his appearance as a set that came with a Happy Meal at McDonalds). He was transformed into a Toa by a bolt of lightning from the Red Star. This is a description taken from LEGO.com. Please do not modify it. (see an archive of the product's page) Master of the laser crossbow! Toa Inika Kongu knows what his enemies are thinking, thanks to the Kanohi Suletu, the Mask of Telepathy. And he knows how to stop them using his laser crossbow and zamor sphere launcher! The Toa of Air’s crossbow lights up with a strobe effect! Facts about "8731 Toa Kongu"
Master of the laser crossbow!